Silky, fragrant, and flavorful, this comforting soup is a perfect dish for a cozy dinner with your honey. 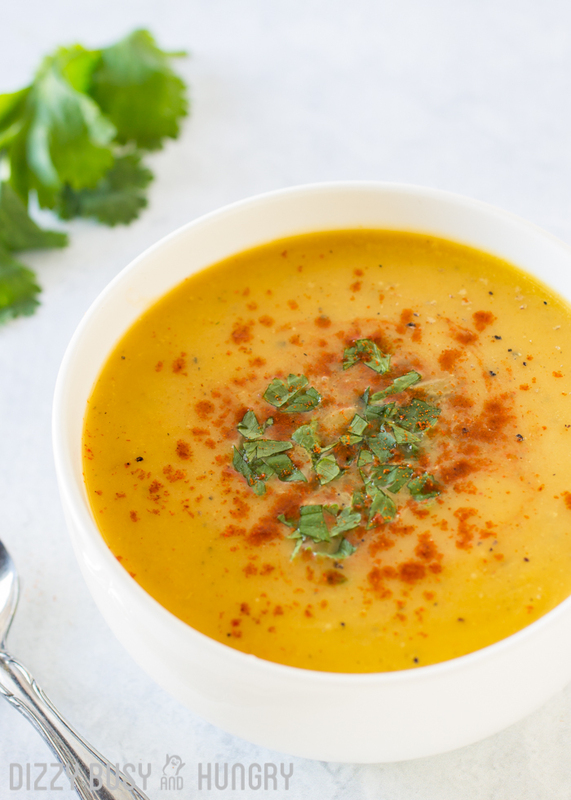 With healthy ingredients like celery and carrots included as well, you can enjoy a nice big guilt-free bowl! Have you cooked with butternut squash? If not, you are not alone! Lots of people are hesitant to work with winter squashes. I know for me, I never really knew how to clean them or how to cook them, and when my kids were young it just seemed like too much trouble to try to incorporate a food that would require more work than your typical veggie and that, in the end, the kids probably wouldn’t even like. Once the kids were older, though, I did venture into the winter squash arena, and actually developed a few recipes using butternut squash (scroll down for a list!). For the most part, they were pretty open to the squash. But now that most dinners involve just me and my honey, I feel much more free to try different recipes involving squashes or other less ‘mainstream’ ingredients! This soup is perfect for a cozy winter’s night meal. Serve it with some crusty French bread or some buttery crackers, and maybe a side salad, and you have a filling and comforting meal perfect for any night of the week. This soup also freezes well, so you may even want to double or triple the recipe and stick the leftovers in the freezer to use at a later date! 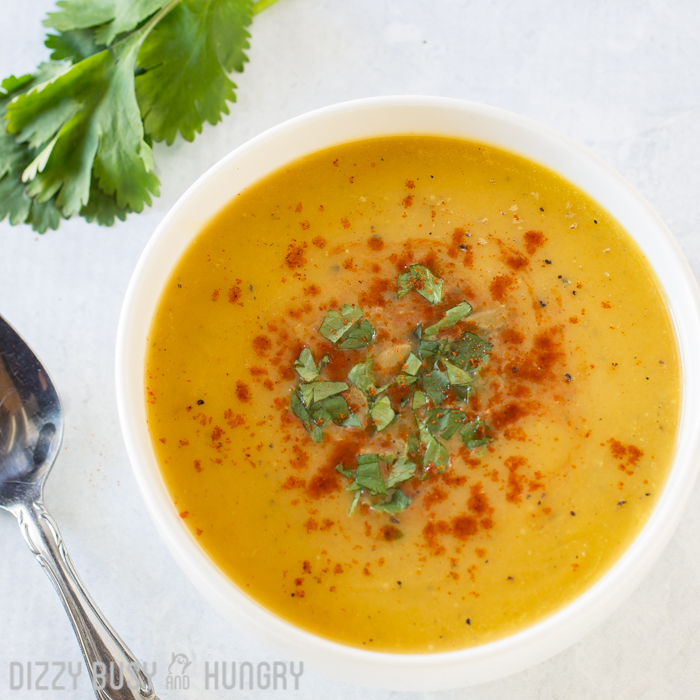 Silky, fragrant, and flavorful, this comforting soup is a perfect dish for a cozy dinner with your honey!! While the squash is roasting, heat the olive oil in a saucepan over medium heat. Add the onion, celery, carrot, cinnamon stick, and coriander. Saute until soft, about 10 minutes. Discard the cinnamon stick, and puree the soup using a blender or immersion blender. Season with additional salt and pepper if desired. A version of this recipe also appears on Bless This Empty Nest’s sister site, Dizzy Busy and Hungry. 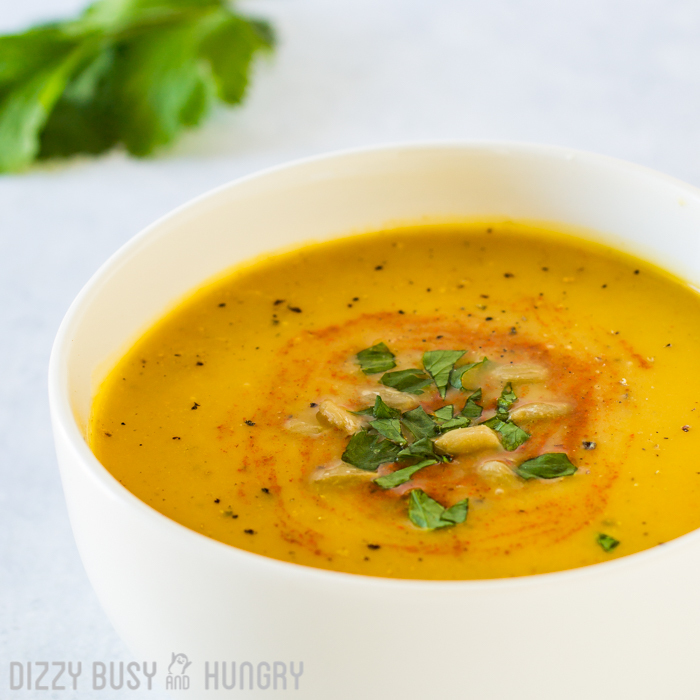 Pingback: Healthy Butternut Squash Soup | Dizzy Busy and Hungry! YUMMY! To be even healthier you can easily skip the butter and the olive oil and never notice the difference. Just substitute broth for the buttet/oil. Remember, the fat you eat is the fat you wear!